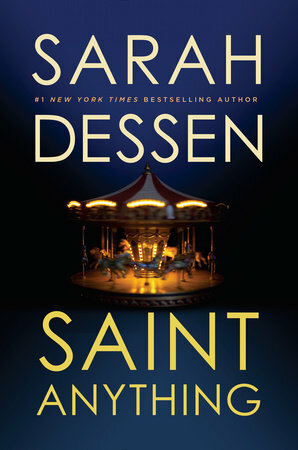 Saint Anything by Sarah Dessen. Viking Books for Young Readers. 2015. Library copy and personal copy. The Plot: Sydney's older brother, Peyton, has just been sent to prison for drunk driving - an accident that left a teenager paralyzed. This is not a story about Peyton. Sometimes, Sydney's whole life seems to have been about her charismatic older brother. She's been invisible, on the sidelines, as his life and troubles and addictions took center stage. This is not a story about him. It is a story about a Sydney, as she discovers who she is, other than "sister of" and "daughter of". As she finds her voice. The Good: Sarah Dessen is just so good. So, so good. Saint Anything is a look at a family whose eldest son is an addict. As I said, it is not about him or what he does to the family and others. It is not about why he is now in prison. No: it's about his sister, Sydney, who has lived in his shadow so long. Her family is one that looks good from the outside, looks perfect and privileged from the outside. And, until her brother's problems, it was. Oh, maybe Dad was a little too much about work. And maybe Mom was a helicopter parent, a bit over involved and over organized and over invested. But it was a world of private schools and a summer house, new clothes and new cars. Sydney is now at the local public school, partly because attorney fees have eaten up her family's money, partly because she wants to hide. Maybe not hide -- but she doesn't want to be at the same school her brother attended, where everyone knows Peyton and knows her as "sister of." When getting a slice of pizza after she school she meets Layla Chatham, sixteen, and makes a friend. This is the brilliance of Dessen: she recognizes that making friends isn't easy. Sydney at first wonders at it, but allows herself to be open to Layla's friendship and finds herself drawn into Layla's circle of friends. Including Layla's brother, Mac. Sydney finds herself attracted to Mac but Layla is her friend and she doesn't want to jeopardize that friendship. As Sydney creates a new life for herself, she finds herself trying to balance her new friendships with her old friendships. And she tries to navigate the minefield of home. Where her mother decides that the best thing to do for Peyton is what she's always done: cheer him on, be there for him, support him, intervene when necessary. Wonder why the warden doesn't recover her concerned phone calls. And can't understand why Sydney isn't more supportive. While all Sydney can think is, but what about the real victim, the boy Peyton hit? And why does all this mean that Sydney now has to live with changed curfews, when she has never done anything wrong? Oh, in reading this I got so deliciously mad at the mother. Much like Sydney herself, I was more accepting of her father's benign neglect, his simply not being there emotionally or physically. As I write this, I castigate myself for allowing that. And like that Dessen left me to find that conclusion. And my being angry at the mother -- it was complicated, but mostly about the mother favoring her son so compulsively while ignoring her daughter in the ways that matter. That I understood the mother, realized where she was coming from, didn't help end that anger. But here's the thing: Saint Anything allowed the mother's story to work itself out, with time. Just as Sydney needs the time to find herself and her friends, her mother needs the time to readjust to the family she has and their needs. And finally, Ames. Ames is a friend of Peyton's. Like Ames, he's an addict; unlike Ames, he has stayed sober. To Sydney's mother, he is a link to Peyton, a connection to her son, and the hope that Peyton, like Ames, can stay sober and have a life. Ames is always over, a confidant, encouraging, charming. But not to Sydney: to Sydney, he is creepy. He makes her uncomfortable. He's always -- there. Her friends who meet him see it, also. but her parents do not and cannot understand why she's difficult about him. And this is also something I really like about Dessen's work, how she knows and shows that the lives of teens, while lived in the same spaces and adults, can be different. That they see things differently. In the case of Ames, sometimes more clearly. But -- again in the case of Ames -- that as teens, they cannot always articulate those things to their parents. And when they try, they aren't heard. There's so much more, of course. There is Mac, the romantic interest. But in a way, the real romantic interest is the Chatham family. Sydney, feeling isolated and alone at home, sees in the close knit and loving Chatham family a warmness and acceptance that she isn't feeling at home. The Chathams aren't perfect, but they give something to Sydney and that includes a way for Sydney to find a way back to her own family, her own parents and brother. Of course, a Favorite Book Read in 2015. 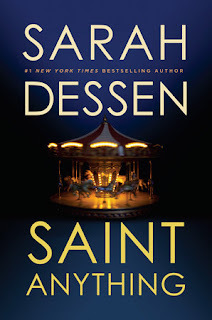 I am a tremendous Sarah Dessen fan, she has certain tropes that I respond to that show up consistently that I love - I have crushes on several of her boys. One of the things that you didn't mention in this review that is one of those consistencies in much of her work (and I enjoyed this review and agreed 100%) is the role of the older female mentor or wisdom speaker. In this case Mrs. Chatham. Macy, in Truth About Forever, has one, Eli's mom for both Heidi and Auden in Along for the Ride. SO often the mothers in Dessen's work piss me off (some exceptions - Moon and More in particular) but I love that she has older women of import in her work too. I haven't read this one yet, but I love Dessen's books too. Many years ago, a writer friend saw me reading a Dessen novel and criticized my choice - she said if I wanted to be a better writer I needed to read better books. Oh she was so wrong - Dessen's novels have so much depth.